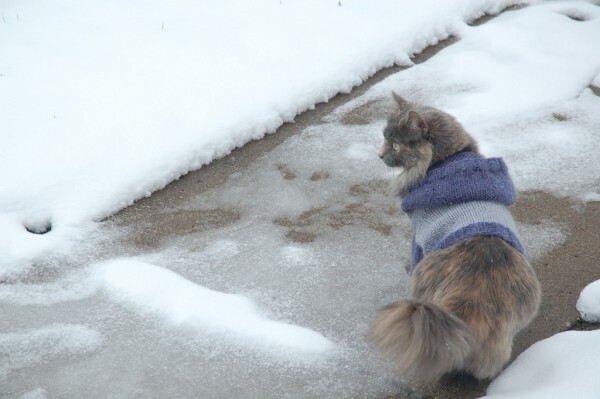 I made Molly a cat hoodie quite some time ago. Jason and I thought RapCat (checkers’ commercials) was just too ridiculous and therefore, pretty funny. We invented a scenario where RapCat was Molly’s secret lover and it was a long standing, pretty bizarre, joke. We even joked about Molly wearing RapCat’s hoodie, you know, the blue and blue one. We laughed so hard about it…. and then I made one for her and we laughed some more. And the really funny thing is she doesn’t mind wearing it at all! Here she is for her fitting before I picked up stitches and knit the legs. Now I know that a lot of cats would have serious objections with any kind of hoodie being put on them, even if knit with the most love. So some other ideas for the hoodie – Big Panda Plushies, A willing stout puppy dog (a little pug maybe? ), you get the idea. I think Miss Molly will enjoy it this win- ter for running outside (we walk with her outside in the morning, it’s too cold in the winter and she gets all stir crazy). Maybe some kitty booties will be in the near future too! Want to knit a cat hoodie? Purchase it on Ravelry. I usually start the summer to fall to winter layering with fingerless glove, a light scarf, and a jacket or thick sweater. Then it goes to a hat, thicker scarf, full gloves, and a medium coat. Now I’m moving into the winter coat, thick wool hat, long warm scarf, and thick mittens. There is only one issue. Late last winter/early spring I lost my mittens! What am I to do? Well how about whip up some new ones with some stash yarn. I’m feeling particularly cold this year and wanted some extra warmth. My friend had just told me about this technique called thrumming. Perfect! Lets give that a shot too. I must say I really enjoy them, they are super warm and really cute to boot! The neat thing is that as you wear the mittens, the roving will felt and it will make a super warm, somewhat water proof mitten. Hooray! Perfect for anybody in the winter. Notes about the yarn choice: I used yarn that was my first shot at natural dyeing with lettuce. It didn’t turn out so hot, but with the green roving in there, it perks right up. I would say that Cascade 220 would be similar in weight and texture. Thrumming When knitting in the roving, just use a thin teased out piece about the length of your pinky. When you get to the stitch that is done with the roving, place your main color yarn over the needle as if to knit, then loop the roving over the needle next to the MC yarn, knit the stitch. On the next row knit the roving and the MC yarn together as if one stitch. If you work them separately you will make an increase. CO 36 sts with CC and arrange evenly on 4 needles; 9 sts on each needle. Join in the round and work 1 x 1 rib (K1, P1) for 3 inches. Change to MC and start working the chart. Rnd 1: (k1, kfb, k to last 2 sts on needle, kfb, k1); K1, kfb, k2, kfb, k2, kfb, k1; repeat ( ) 2 more times; 45 sts on needles. Note: Work chart, but skip over the gusset stitches and continue chart after the second place marker. Rnd 2: Knit 22sts, place marker, m1, k1, m1, place marker, knit to end. Rnd 3: Knit all (as in knit all stitches in round three). Rnd 4: Knit 22sts, slip marker, m1, knit to pm, m1, slip marker, knit to end. Repeat Rounds 4 and 5 five more times – 14 rounds worked. Knit all for three rounds. Knit to marker, remove marker and place gusset (stitches between the two markers) on to scrap yarn, remove second marker, knit to end. Knit all until piece measures to just above the little finger. End on row 1 or 4 of the chart. The remainder of the mitten is worked with just the main color. Rnd 1: K1, ssk, knit to the last three stitch on needle two, k2tog, k1; k1, ssk, knit to the last three stitches of needle four, k2tog, k1. Repeat Rnds 1 & 2 two more times. Repeat Rnd 1 until 20 sts remain. Arrange sts evenly on 2 needles and use the kitchner st to BO all sts. Pick up sts on scrap yarn and arrange evenly on 3 needles. Rnd 1: K to end of needle 3, pick up and k one st at gap between needle 3 and 3. Rnd 7: (K1, k2tog, k to end of needle) repeat to end. Repeat rnds 7 & 8 two more times. Cut yarn and thread through sts on needles, tighten up the hole and weave in all ends. Repeat all steps for the second mitten.